This month our Product of the Month is our Printed Tablecloths. A table cloth printed with your logo or branding is an easy way to add style to your stand without breaking the budget. It doesn’t seem like much, but a table covered with a simple, quality cloth incorporating your logo will add the finishing touch to your stand and will make a big difference to the overall look of your display. This versatile product can be used for anything from a stall at a Christmas Craft Fair to part of a large-scale exhibition stand. 1. New lower price – we have recently reduced the price of our 5ft table cloth from £55 to £52 and our large 6ft table cloth from £65 to £62, making it one of the most inexpensive ways to enhance your exhibition stand. 2. Quality – our table cloths are made from 205g polyester fabric with a brushed cotton finish. The edges are overlocked for a high quality finish which improves the drape of the cloth. The fabric has anti-stain, anti-crease and colour-fast inhibitors fused within the weave so it has been developed to look great even after repeated washes. Your logo is printed in full colour onto the cloth in an area up to a size of 700mm x 350mm (or 400mm x 400mm square). 3. Versatile – a printed table cloth adds a smart finishing touch to any display stand. 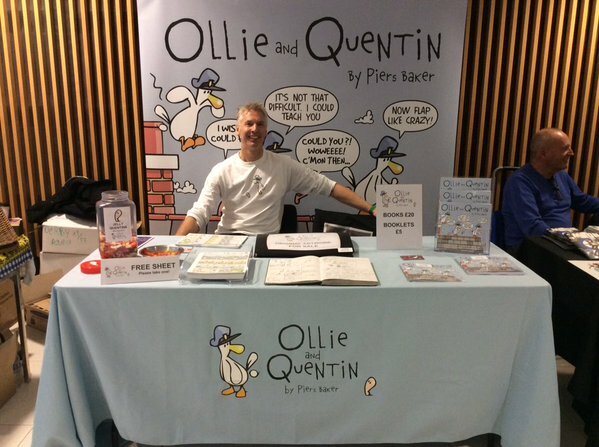 They can be used on any kind of stand from a stall at a craft fair or school fete to a larger exhibition stand. Also ideal for use at school open days, wedding fairs, business conferences, trade shows, art exhibitions and community events. 4. 33 colours – we offer printed table cloths in 33 colours so are bound to have a colour that fits with your brand or corporate colours. Our most popular 20 colours are available in stock for fast UK dispatch. 5. No logo set up fee – many other companies add on extra cost to set up artwork. We don’t – the price you pay includes logo set up, print and packaging – no hidden extras. 6. No minimum order – you will still only pay the same great low price even if you only want one printed table cloth. 7. 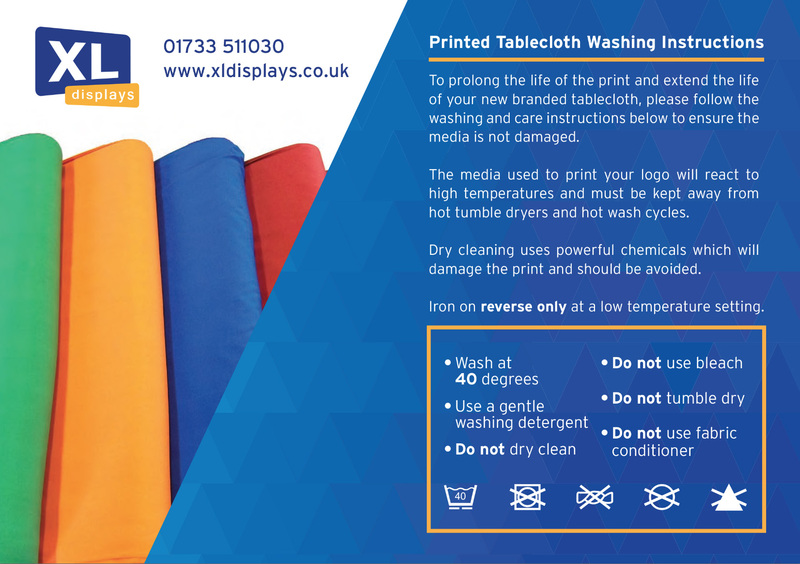 Easy care – our table cloths are easy to look after – machine washable at a low temperature. Care instructions are included with each product. 8. 48 hour dispatch – we will dispatch your printed table cloth within 48 hours, once artwork has been signed off, with next day courier UK delivery. 9. Easy ordering process – simply order your branded table cloth online. You can also upload your logo via our website and one of our graphic designers will check it and send you a proof to sign off before your table cloth is printed. 10. Price promise – we will match a lower price on a like-for-like product – if you find the same product cheaper elsewhere contact us and we’ll beat the price. Our custom printed table cloths are great value and will make all the difference to your event stand. Lightweight and easy to transport they are one of the most affordable, useful and portable exhibition products on the market. At XL Displays we provide cost-effective display solutions for exhibitions and events. For more information about our Product of the Month – Printed Table Cloths or our full range of products, including pop up stands, pull up banners and office screens, please contact us or call our sales team on 01733 511030.